On August 21, United States’ President Donald Trump provided the road map to America’s next South Asia strategy, mainly centered on America’s Afghanistan Policy. Given the United States, longtime involvement in the region, America’s Afghanistan policy plays a key role in United States overall foreign policy. Given the primacy attached, Trump’s speech reflected two very significant factors: First, there was a clear identification and condemnation of Pakistan as a significant actor contributing to terrorism. Secondly, there was greater confidence expressed in India’s role in the region at large and Afghanistan in particular. 1.What does Trump’s new South Asia policy hold for U.S., India, and China? 2. Is there a continuity/change in America’s policy and what can be further expected? 3. 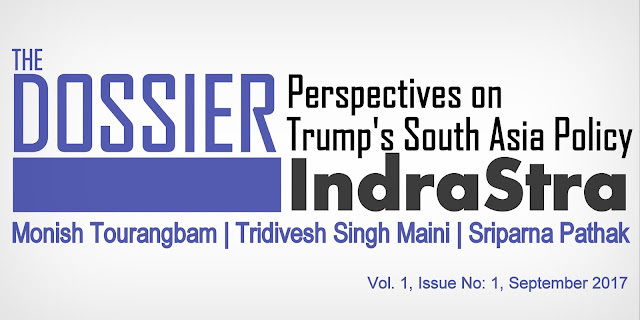 What will be the larger implications of Trump’s new South Asia policy, if any? To address the queries, the series is divided under three perspectives- American, Indian and Chinese. Reflecting on America’s foreign policy under the Trump administration, Dr. Monish Tourangbam argues that the new U.S. strategy on Afghanistan is designed to avoid losing, rather than winning in Afghanistan. While arguing from an Indian perspective, Tridivesh Singh Maini suggests that while it is tough to predict how U.S. policy will pan out towards Afghanistan, one major shift in Trump’s approach is that unlike previous U.S. administration’s he has not really drawn any red lines for India’s role in Afghanistan. Drawing on the Chinese perspective, Dr. Sriparna Pathak argues that as China shares an “all weather friendship” with Pakistan, public shaming of Pakistan for shielding terrorists is clearly not something that is acceptable to China. However, with respect to terrorism, China has its own woes emanating primarily from its Xinjiang province. Therefore, the American policy in South Asia, which in all probability will see greater American involvement in the region, will have to be carefully considered by the foreign policy mandarins in Beijing.